2013 Miss Moorhead Maren Groff strikes a pose. Hairspray, evening gowns, a bubbly personality and a smile: all ingredients for an excellent pageant contestant. Maren Groff has all of them. An mass communications sophomore, Groff was crowned Miss Moorhead on Sept. 7. Groff competed against three other women that Saturday. It was a one-day show where they were able to get in all the events and rehearsals. “I love show tunes, and this song is just the perfect mix of sassy and sweet,” Groff said. Groff said her favorite part of the competition was the personal interview. “The judges were really great about asking a variety of questions,” she said. She continued to explain how judges could ask questions ranging from the contestants’ favorite colors to a current event. This isn’t the first title Groff has won. She was also crowned as Miss Baxter in her hometown over a year ago. She got involved in pageant work through a small competition in Nisswa, Minn., where she was then sought out to compete for Miss Baxter. Groff explained when a contestant wins the title for the Miss America Organization they are automatically registered to run for the next step. Winning Miss Baxter gave Groff the chance to run for Miss Minnesota last summer. Now that she has won Miss Moorhead, she will get to go back June 2014. 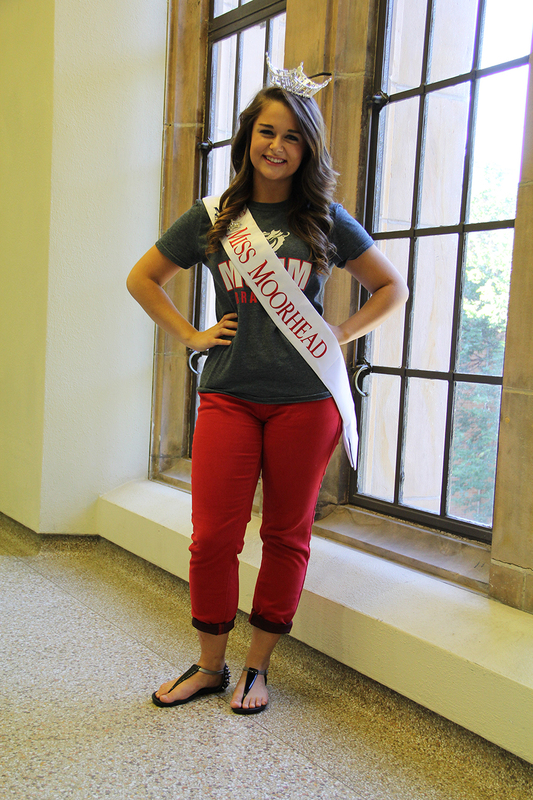 Groff was the first student at MSUM to be crowned Miss Moorhead, even though the competition is actually held on campus. Groff loves working with children and helping them learn to read. She said would never change her platform because she has been working on it for a while now and has already started many relationships. She wants to continue what she started.